When I review an ergonomic input device, I’m often eager to finish with it so I can get back to my usual setup. I’ve spent years – literally, years – getting my workstation just the way I want it with the devices that work best for me. So, I was quite surprised to find myself becoming satisfied with the review sample mouse I received from Goldtouch. It’s definitely the best alternative design I’ve used since the Handshoe. It may not be obvious at first glance, but the Goldtouch is what might be termed a semi-vertical mouse. Vertical mouse designs address the problem of hand-flattening, the wrist-twisting posture induced by most conventional mice. Ergonomists generally agree that palm-down mousing is bad, but disagree on the best alternative. The most obvious approach, and the one adopted by outright vertical mice such as the Evoluent, is to pull the user’s hand up into a “handshake” position, 90 degrees from the work surface. While this design untwists the wrist nicely, it can result in greater required “pinch” force to move and click the mouse. Additionally, you lose the benefit of gravity when pressing mouse buttons sideways, subtly increasing the force required for an action repeated hundreds of times a day. A 24 degree horizontal slope helps to keep the user’s wrist and hand in a more natural position. A different and possibly more sophisticated approach is to compromise between totally flat and vertical. Research indicates that an angle of about 20-30 degrees untwists the wrist acceptably without running into the drawbacks of the vertical design. The Goldtouch, like the Contour mouse, uses this alternate approach. 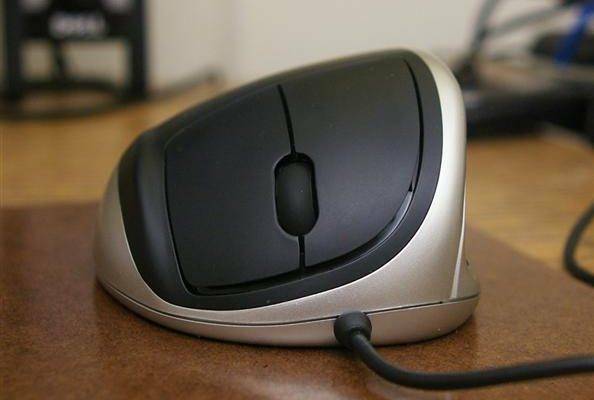 The angle is so subtle that many users may never notice it, but they will likely notice the increased comfort and the more “natural” feel of the Goldtouch mouse. If you’ve used an ordinary mouse – and who reading this hasn’t? – you should have no significant trouble adjusting to the Goldtouch. While its design encourages the “optimal” practice of mousing from the elbow rather than from the wrist, it doesn’t force any particular approach on the user. For this reason, there really shouldn’t be much of an adjustment period, for most users, with the Goldtouch mouse. Cold plastic just isn’t very inviting. A design may be shaped perfectly, but if its surface isn’t pleasant to touch, it will cause discomfort and be bad for ergonomics. I’m not sure what they call the particular material used on the top and thumb side of the Goldtouch. It’s a smooth, slightly tacky black rubber texture that I find very comfortable for the fingers. 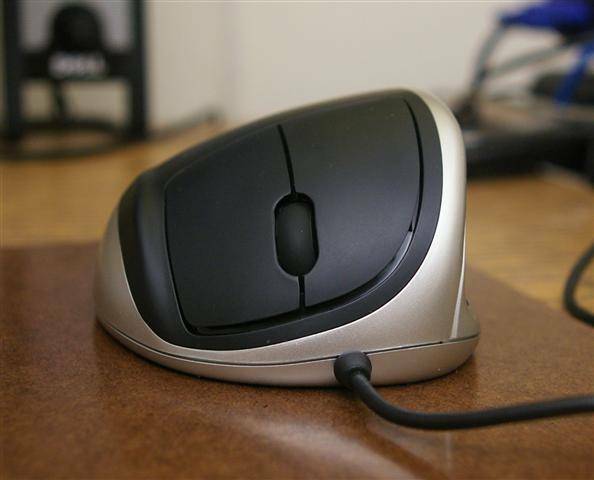 While the looks of a device have absolutely nothing to do with ergonomics – unless the user is outrageously suggestive – the Goldtouch is not afflicted with the ungainliness of certain other ergonomic mice. It’s not wide like the Handshoe, long like the AirO2bic, or joysticky like the 3M ergonomic mouse. There’s no “what-is-THAT-on-your-desk” effect with a Goldtouch mouse. Rather, it’s an extraordinarily good-looking device, with nice contours and a black on silver finish to complement your existing setup. In my opinion, a integrated thumb rest should be a no-brainer for mouse designers. There is just no reason I can think of why the thumb needs to tough it out hanging in midair when it might just as easily be parked in a safe, comfortable nook along the side of the mouse. 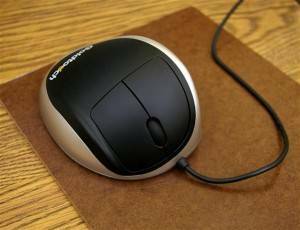 The Goldtouch mouse excels in thumb comfort by providing such a resting spot, lined with the same rubberized material that covers the top of the unit. Some people have complained that the Goldtouch mouse is too big for them. There is nothing anybody can do about this, unfortunately, because Goldtouch doesn’t offer a size selection. The mouse either fits you or it doesn’t – unless, of course, you have some way to change the size of your hand. My hands are fairly large, and I find the Goldtouch a good fit. Ladies, or people with small hands, might want to look at a mouse with multiple size choices, such as the Contour Design Perfit mouse. Coming from the same company that brought us the famous Goldtouch keyboard, the Goldtouch mouse doesn’t disappoint. Well-designed on sound ergonomic principles, it presents a normal look and an easy adjustment for any user. It’s also more affordable than major competitors, at less than $60 as of this writing. Highly recommended.